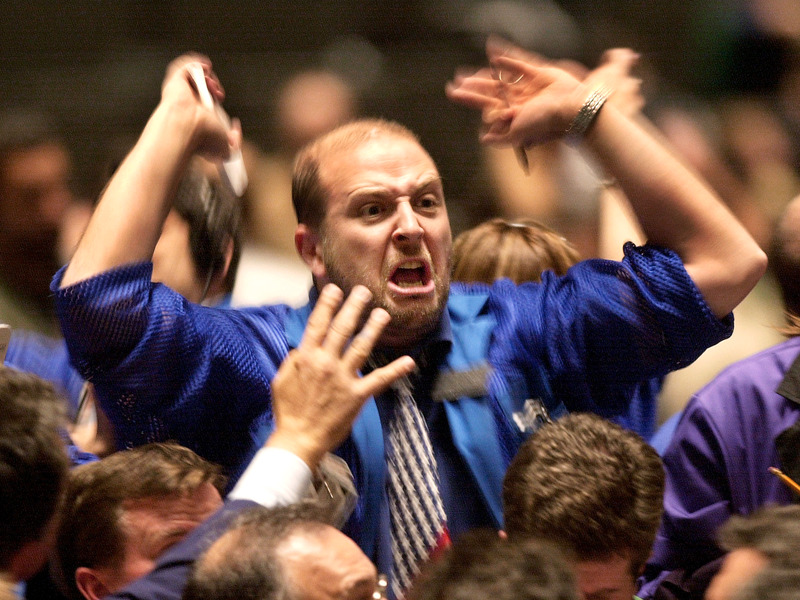 AP ImagesA real-time look at a trader souring on US stocks. Investors are souring on US stocks to an extent not seen since the start of the financial crisis. 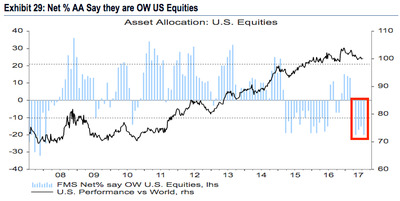 Global fund managers have a 20% net underweight allocation to US equities, which is the lowest since January 2008, according to a Bank of America Merrill Lynch survey of 207 money managers with almost $US600 billion under management. That means they’re looking to other geographies and even other asset classes for returns — perhaps due to outright bearishness on stocks, but more likely because they see better opportunities elsewhere, with benchmarks like the S&P 500 already sitting near record highs. But while the survey results reflect an undeniable softening of US equity sentiment, they must be taken with a grain of salt. After all, respondents were more than 10% net underweight in each of the three prior months, and the stock market has held up just fine, with the S&P 500 rising 4.5% since the start of April. Bank of America Merrill LynchGlobal fund managers have the biggest underweight allocation to stocks since January 2008. BAML Global Research chief investment strategist Michael Hartnett, who spearheads the monthly survey, also throws water on the notion that any sort of market top is imminent, citing cash levels that are still too high: With extra capital to deploy, investors will still put some of that into stocks, even amid flagging sentiment. Fund managers have 4.9% of holdings in cash, down slightly from 5% the month before, according to BAML data. Only when that measure falls below 3.5% does it represent a sell signal. Still, there are some bearish developments occurring under the surface of the stock market. Tech stocks, the big winners of the eight-year bull market’s latest leg up, are no longer the most overweight sector for global investors, BAML data show. That would be banks, which have intriguing fundamentals of their own. Managers shying away from the heavily-weighted tech sector was inevitable, given their outperformance, but it can’t be ignored that they’re currently the biggest driver of earnings growth, excluding energy stocks. And speaking of earnings growth — which has historically been the biggest driver of share price appreciation — sentiment around it is also going in the wrong direction. 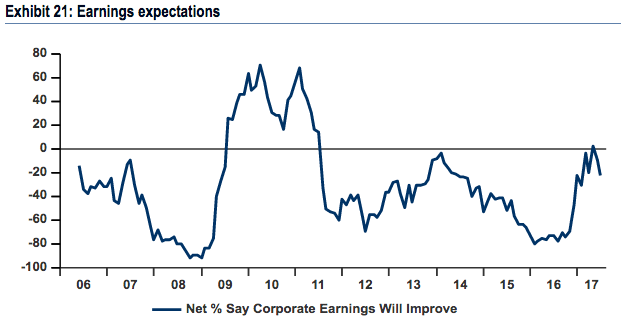 A net 22% of survey respondents say corporate profits won’t “improve substantially” over the next 12 months. So while none of these shifts in sentiment are signalling the imminent demise of the US stock market, one thing seems clear: the tide is slowly turning. Bank of America Merrill LynchThe earnings outlook from fund managers is going in the wrong direction.